Lloyd Hobbs and his fifteen-year-old brother Russell had made the short trip from their home on St Nicholas Ave to the Apollo Theater on 125th Street for the 7 PM movie show, not emerging until 12.30 AM. When they stepped back onto 125th St, they saw crowds down the block at the intersection with 7th Ave, and went to investigate. They followed as police pushed the crowd north on 7th Ave. As people milled in front of a damaged auto parts store near 128th Street, two officers in a radio car pulled up and called on the crowd to ‘break it up.’ Fearing that they had been mistaken for rioters, the boys ran in separate directions, Russell up 7th Ave, and Lloyd diagonally west on to 128th St. Officer John McInerey then drew his gun and shot Lloyd; the officers then loaded him into their car and drove him to Harlem Hospital. Hobbs died 11 days later, on March 31, as the first session of the Mayor’s Commission hearings on the riot opened. McInerey claimed that the officers had seen Hobbs throw a stone through the window of an auto supply store at 2150 7th Avenue and steal goods(, and that he called on him to halt before opening fire). 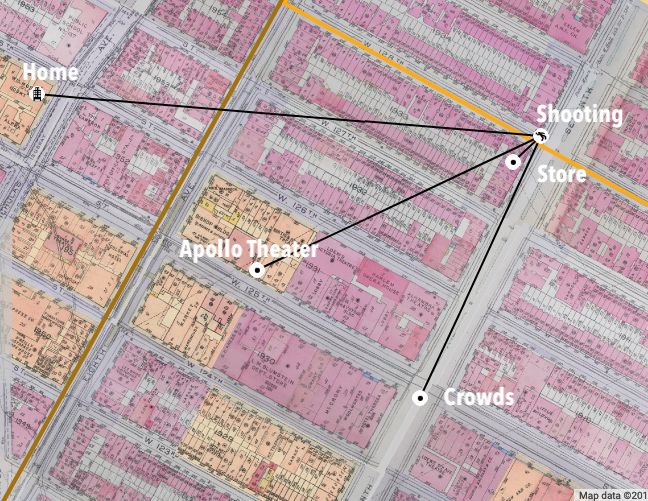 Several witnesses watching events from the corner of 128th and 7th Ave testified to seeing the crowd moving up the avenue, and Hobbs rush from the crowd as police pulled up, but not any looting, any goods on Hobbs, or any call for him to halt before McInerey shot him.